SecuritySolutionsWatch.com: Thanks again for joining us today, Ken. It’s really an honor to chat with EMC’s newly appointed CTO in Surveillance and Security Congratulations !! Please tell about your new role and your vision for EMC going forward. Ken Mills: Thank you for the kind words. I am very excited about my new role. I have to say, I am enjoying traveling with our account teams and gettingsome great feedback on what EMC is doing in the surveillance sector. I have spent a lot of time over the years speaking at industry events as well as talking to customers and partners. I have been very fortunate to have spent time in both the traditional security world and in the ITworld over the last 15 years. It is amazing how different the two worlds are. This has become especially evident as more and more of the surveillance industry moves to the datacenter and the cloud. One of the topics I am frequently asked to speak on in recent months is about the tremendous rise of video evidence in the public safety sector right now. Police agencies are being bombarded with projects to add citywide cameras, body cameras, in-car video, digital evidence and a number of other use cases. Storage cost has become a huge topic of discussion for these projects. We are seeing cities with requirements of 4 Petabytes+ of storage for all this video. To put it in perspective, that is equal to over 4,000 hours of HD video. The IoT has also been a hot topic for our customers and partners. There is a ton of data coming from all these new smart sensors and devices. You add that to what you can get out of an average camera and you can quickly come to the conclusion that a black box is just not going to cut it. IoT data from embedded systems will account for 10 percent of the digital universe by 2020, according to one IDC study sponsored by EMC. SecuritySolutionsWatch.com: Since our previous chat in December, together with Police Chief Terry Gainer, much has changed. Any new products, solutions, or trends in the threat landscape you’d like to discuss? Ken Mills: The world of video is moving so fast and the surveillance industry is being put to the test to respond. Many video surveillance management application companies are having to re-write their applications to take advantage of this move to the enterprise and the cloud. Customers are also demanding that their surveillance systems are secure. I am fortunate enough to sit on the Cybersecurity Advisory Board for the Security Industry Association and it is clear that the pendulum has swung toward cybersecurity. Every one of my fellow advisory board members report being asked what they are doing to secure their products. At the same time, our partners are asking to make our products easier to install and manage. The balance between simplicity and security is a tough rope to walk. Fortunately, at EMC we have the gold standard in enterprise security on our team with RSA. Our surveillance team is always on the lookout to see how we can take the industry-leading security solutions from RSA and apply them to surveillance. A simple, yet underused example is two-factor authentication with RSA. RSA integration strengthens user authentication and system security, augmenting the security of the at-rest video, as well as the health of the surveillance installation. Since we last talked, we have launched five new solutions for surveillance. We’ve partnered with Avnet to build a compute plus storage bundle that greatly simplifies the deployment of an enterprise surveillance solution. With ATOS, a global partner of EMC, we are working to develop and bring to market surveillance storage as a service. As customers begin to consider cloud for their surveillance storage needs, we want to make sure they have a best in class enterprise option. We have also launched a surveillance solution with VCE, the Converged Platforms Division of EMC. VCE brings together VMware, Cisco and EMC together in a single package for large-scale surveillance deployments. The VCE solutions for surveillance can handle thousands of cameras in a single rack with one number to call for support. It has never been easier to take advantage of this kind of pedigree in surveillance. And, finally we are launching a partner solution with Axis, Genetec and Avaya at ISC West. This partnership delivers “LINK”, the security industry’s first validated surveillance solution that helps secure video from the device all the way to the storage. It offers a cyber-hardened solution that provides scalability and reliability for enhanced security management while helping to reduce the possibility of a cyber-security breach. The partnership ensures that customers have the best solution to deliver surveillance at scale with the confidence they expect from market leaders in surveillance. Lastly, we are releasing our second generation of the Video Surveillance Storage platform. We strongly believe that the surveillance market needs unique solutions and to that end we have brought our 6-9s enterprise class storage platforms to the surveillance market. Due to the success we had with our first generation Video Surveillance Storage (VSS), it was a no-brainer to take our most current generation storage platform and customize it for the surveillance market. SecuritySolutionsWatch.com: We also understand that you have been nominated for the Board of Directors at SIA. Again sincere congratulations! SIA is certainly the world’s leading association for security solutions and has done an outstanding job in advancing the interests of its’ members. What’s your perspective, Ken, regarding the contribution of SIA to the security community at-large? Ken Mills: SIA has done so much to help move the surveillance industry forward, it is an honor to sit on such a prestigious board. I am proud to be part of the many conversations with my peers at SIA about how the association wants to drive growth across the entire industry. The creation of the cybersecurity advisory board is a great example of this commitment. Cybersecurity is important to our customers and partners and the SIA wants to make sure our members have the most current insight and recommendations to be successful. In talking with SIA leadership, it is clear they understand that the IT and surveillance markets need to work together. It is no longer acceptable to keep each other at arm’s length. I am excited to be a part of this commitment to move the industry forward. 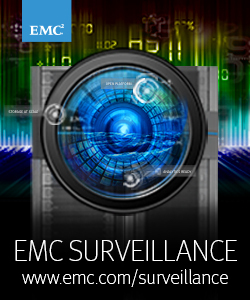 At EMC we want to partner with the surveillance industry to learn from the experts and share our knowledge as well. SecuritySolutionsWatch.com: The SIA Membership Directory truly is a blue-chip “Who’s Who” in the security space. Your thoughts on the benefits of SIA Membership for its member companies? Ken Mills: SIA is much more than a blue-chip directory. It is very committed to bringing value to its members. There many different advisory boards and committees all focused on making the industry better. It is truly amazing to sit on calls and in meetings with competitors all working together to help the industry as a whole. The Security Industry Association provides valuable data and organizes several high-level events and webcasts. I am also a big fan of the insight series that SIA does. They publish insightful articles written by some of the brightest executives in the industry. SecuritySolutionsWatch.com: Thanks again for joining us Ken….the floor is yours…any other subjects you’d like to discuss? Ken Mills: Thank you for the opportunity to share my thoughts and some exciting things that are currently happening with EMC. This is truly an exciting time to be in the surveillance market. To help put this in perspective, we have shipped over 500PB in surveillance storage in the last 24 months alone and have over 3 million cameras storing video on EMC storage right now. This is just the tip of the iceberg and we are looking forward to what the future has in store for surveillance and the IoT. SecuritySolutionsWatch.com: Can you talk to us, Terry, from your POV, about some of the trends in public safety impacting the surveillance and physical security industry? Terry Gainer: The trend that is having the greatest impact is the emergence of new surveillance devices. Technologies such as drones, body cameras, license plate trackers, audio/video reconnaissance, and facial recognition are causing a large influx in data. This, in turn, is creating a number of challenges for public safety organizations with regard to data management and integration, evidence retrieval, and analytics. There is also a significant push towards body-worn devices as a standard technology for police organizations, supported by the establishment and United States Federal investment in the Body-Worn Camera (BWC) Pilot-Partnership Program. One third of the 12,000 police departments in the United States are already using body cameras and new departments are deploying devices every day. Some cities and states are mandating the addition of body-worn devices. But the associated costs are significant, even factoring in the availability of Federal grants as a part of the BWC program. Compounding these challenges are the varied legislative requirements associated with these new devices. Laws on evidence management and storage differ from state to state and on the type of crime. Data on minor traffic stops, for example, might only need to be kept for 30-45 days, while DUI data might need to be kept for 3 years or more. Data for federal crimes might need to be kept for the length of the imprisonment, or in some cases, forever. Most states have laws that require that the evidence used in a case be kept for a minimum of 7 years. Despite these inconsistencies, one thing is clear: video from body-worn cameras has a long shelf life. With the rise in terrorism, threats, and even police use of force, public safety organizations are feeling heightened public pressure to provide footage of incidents and to access that data quickly. While lawmakers still struggle with this delicate line between privacy and safety, public safety organizations are doing what they must to protect citizens against these atrocities. This has led to acceleration in the purchasing cycles of new device types such as body cams—and as a result, the rate of data growth. SecuritySolutionsWatch.com: Let’s take a second to double click on some of these topics. Can you elaborate on your last point in more detail? How are recent events in the news around “police use of force” impacting the way police organizations think about surveillance and its impact on public and police safety? Terry Gainer: Over the years, the availability of video recording on mobile devices has cast a light on specific incidents involving police use of force. This has led to an overall increase in public scrutiny and demands for transparency. Police organizations are expected to react quickly to media and public requests and to acquire the technology/systems that will capture events and interactions of the police and citizens for immediate access. Because of this increase in public pressure, I’ve seen several instances in which police organizations purchase new equipment—in most cases, body cameras—without buying or considering the cost of storage, retrieval, analysis, or the integration requirements of this new data with existing stored or captured data. The average cost of a camera is $400. Purchase 1,000 cameras and you’ve spent $400,000. But the additional cost of those cameras for retrieval, analysis, and integration over a 5-year period is$1.5 million—four times the cost of the cameras alone. Many police organizations are vying for Federal grant money through the Body-Worn Camera Pilot-Partnership Program to apply to the purchase of body-worn devices.However, the program set aside a “mere” $75 million for this purpose, which will only pay for a small percentage of body-worndevices across the country. But before jumping to accept whatever grant money is available to them, police organizations—as I just mentioned—must first consider the wider implications of storage costs. To give yousome examples, the cost of storage in Orlando willrun $460,000 a year, and in New York City, appr oximately $12 million a year. These are significant costs that need to be highly scrutinized up front. SecuritySolutionsWatch.com: Ken, you have over 15 yearsof experience in the surveillance industry.Can you explain the importance of storage in surveillance and why it needs to be prioritized as a critical factor for police organizations? Ken Mills: A challenge I’ve seen with many public safety organizations is the inability to see the holistic picture when it comes to managing data. Addressing the topic of body-worndevices cannot be done independently of other data sources. In November, I participated on a Secured Cities panel with Rodney Monroe, the recently retired Chief of Police for Charlotte, NC. Chief Monroe highlighted three key things that police departments must to do before deploying body-worn cameras. Develop a complete evidence strategy beyond body cameras; body-worn video is not the only data they will need to manage. Regardless of how they store their body-worn data, police departments must also manage data from a host of other applications like crime labs, digital evidence,surveillance, drones, in-car, license plate recognition, interview rooms, crime scene footage and more. At EMC,we strongly advise against siloed architectures as they are limiting when it comes to the transport,analysis, and value-generation of data. Forward-thinking public safety departments like the City of Charlotte are building a data platform that can collect, store, and manage all these different pools of data. The City of Charlotte implemented a Public Safety Data Lake—a concept developed by EMC Surveillance that speaks to an open architecture that is scalable and analytics-ready. The data lake infrastructure provides a more cost-effective storage environment with the ability to seamlessly integrate new types of devices while gaining more control over the data. Finding a storage vendor that offers this type of open platform will become critical to moving towards this enterprise model, which will prove more cost effective, less complex to manage, and will allow for more innovation and the flexibility to add applications and gain value from s urveillance data. Many police organizations are now using cloud storage—and there has been great debate lately about the cost of cloud storage versus on-premises storage. EMC has both offerings; Ken, can you talk to us about some of the cost implications of cloud vs. on-prem? In my last blog on Security Solutions Watch, I talked about the three different types of surveillance architectures: distributed, centralized, and cloud [Link to Blog]. The choice to implement one or more of these architectures is greatly dependent on scalability and cost. Scale is easier to evaluate based on the size of the organization. Cost is where things can become a bit muddled. We often hear that cloud is a lot less expensive than on-premises storage. While cloud can be very cost effective, organizations that haven’t been properly informed of the long-term impact of storage on their purchase may incorrectly perceive some cloud offers to be more viable than on-premises storage. For instance, one well-known cloud storage provider/body camera manufacturer offers an unlimited cloud storage plan for $24/month per camera; this seems like a great deal—until you really look at the cloud costs compared to on-premises storage. Let’s look at a real-world example. The City of Alameda signed a contract with a cloud storage provider for 80 body cameras valued at $424,752.61. This is a five-year contract with ongoing yearly cloud storage costs of $62,856 for each of the five years. The storage alone for this five-year project is $314,280. That is a lot of money for 80 cameras. Furthermore, the city is on the hook in year six to spend another $314,280 for the next 5 years of storage—and that’s assuming the cloud storage provider does not raise its prices. This 5-year cycle of spending over $300,000 on storage for 80 cameras continues forever. Now let’s compare this to what an on-premises storage solution would have cost. Based on best practices published by the Bureau of Justice Assistance (BJA), we will assume that the City of Alameda needs about 80 terabytes to meet the evidence demand for 5 years (approximately 16 TB per year). We will also assume that the City can purchase on-premises storage at roughly $250/TB—approximately $40,000 per year in on-premises storage costs. Over the course of this 5-year plan, Alameda would have reduced its costs by 36 percent—saving over $100,000—and the savings would become even more dramatic as the City increased the number of cameras. Many cloud storage providers also require continuous renewal of their contract in order for customers to maintain access to their video. This becomes very profitable for the vendor—and another significant, and often overlooked, expense to the customer. SecuritySolutionsWatch.com: So then are you suggesting that public safety organizations use an on-premises only approach? Ken Mills: No, because there is not a one-size-fits-all solution for this. What we are saying, is that police organizations are often under intense pressure and make the decision to jump into cloud before really doing their homework. There are some storage vendors that are bundling body cameras with cloud storage, which initially can be much cheaper than purchasing these components independently. Cloud storage is an easy place to start, especially for a police organization looking to make a quick purchase. But, organizations with more than 1 PB of data need to consider the cost implications of storing that data in the cloud if they will be paying monthly storage and access fees for 25 years or more. Cloud storage costs are forever—and those costs are not fixed. Storing data in the cloud has its benefits, but cloud storage needs to be implemented as a part of a holistic surveillance strategy that takes into consideration all organizational data challenges. Building an open platform should be a critical part of this strategy. Choosing a storage vendor like EMC, that offers both on-premises and cloud architectures, will allow organization to scale as regulations change and data types are added. We have seen a lot of success, such as in the instance of City of Charlotte, where police organizations use a hybrid or tiered approach to storage. In this solution, some of the data is kept on-premises while other data is sent to the cloud. This is a great approach and one we are seeing increasingly more often. SecuritySolutionsWatch.com: Where could someone go to learn more about evidence management solutions at EMC? Ken Mills: They could take a look at this short paper, “Evidence Storage: In the cloud or not?” for greater detail on this topic. Our website is the best place to go for general information on EMC Surveillance solutions, www.emc.com/surveillance. SecuritySolutionsWatch.com: Thank you again for joining us today, Terry and Ken. Are there any other subjects you’d like to cover. Ken Mills: Not today, but I look forward to joining you again in the new year where we’ll take a forward look at 2016 surveillance trends.